A restaurant owned by two amazing individuals with enough trust and faith to give one team the chance to make the display for their meals to be served to customers with the hope of satisfaction. A team of 7 officers, 1 advisor, and dedicated participants take on a project which will open doors to countless more and a lifelong memory of the experience. 6 weeks, 5 meetings, 2 show days, and ultimately 1 goal: to get the project done and done well. On September 20th, 2018, owners of local restaurant, Alyssa and Anthony Roost arrived by surprise set up by advisor Mrs. Shokrai to meet with the officers and members of Clay Club to discuss and negotiate the production of plates for their restaurant, Vine and Grain, in the Streets of Brentwood. “I wanted to give you guys (the members) the opportunity to meet with them so you guys could do the negotiating and for you to take ownership of the deal… I wanted to bring them back into the fold and I talked to Alyssa telling her I would love to work with her again,” said Shokrai, excited to be able to give her club this experience and chance. This is not the first time that the owners have asked the Heritage club to fulfill their desires for dishes. In 2016, the couple asked the members to produce a much more large scale project for the same restaurant, which the desire to have dinnerware from a local producer to compliment their restaurant as it is built on the foundation of local grown, farm-to-fork meals. 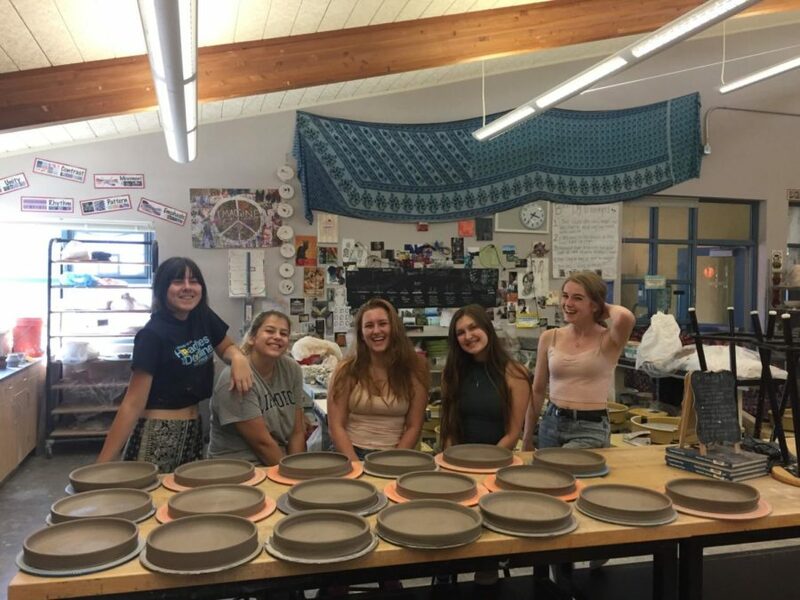 This year, it has been agreed upon to create 30 plates, with each plate using approximately forty pounds of clay! With October break in the middle of the November 2nd deadline, it gives the Clay Club members four weeks to throw, fire, and glaze all these pieces, with only 3 club meetings in between. “The time crunch offered us the opportunity to learn how to work well together and learn how to create quality pieces under pressure which was really exciting,” said Amelia Kolda, an officer and one of the key members in the making of the plates on the wheel October Break. All in all, everyone in this commission project are working to the best of their abilities in order to produce their highest quality work for the Roost couple. The project ‘checkpoint’ is coming up soon, and the deadline creeping its way, closer and closer. There may be bumps in the road, however there is no doubt that this project will not come to a successful end.